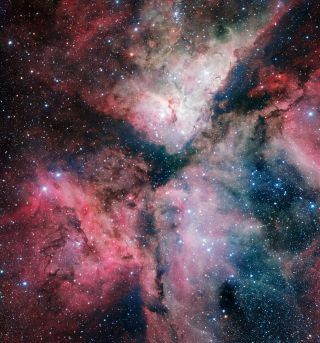 The spectacular star-forming Carina Nebula has been captured in great detail by the VLT Survey Telescope at ESO’s Paranal Observatory. This picture was taken with the help of Sebastián Piñera, President of Chile, during his visit to the observatory on June 5, 2012 and released on the occasion of the new telescope's inauguration in Naples on Dec. 6, 2012. A gorgeous photo of a star-forming region of space called the Carina Nebula marks the inauguration of a new telescope — the largest instrument in the world devoted to surveying the sky in visible light. The VLT Survey Telescope (VST) at the European Southern Observatory's Paranal Observatory in Chile was officially inaugurated today (Dec. 6) in Naples, Italy. While the Carina nebula has been photographed many times before, most telescopes can only observe a small part of it at once. The VST, designed for large surveys of the sky, has a very wide field of view, and was able to image almost all of Carina in a single photo. The nebula is a cloud of glowing gas and dust that serves as a nursery for baby stars, which are forming there at a furious rate. Carina is relatively near Earth, and lies about 7,500 light-years away in the constellation Carina (the Keel). The many hot, young stars in the nebula release ultraviolet light that heats up the hydrogen gas, making it glow red. Just above the center of the photo is a bright, volatile star called Eta Carinae, which is visible to the naked eye in the southern hemisphere. This star's brightness has varied significantly over time. At some points, it has been invisible to naked-eye observers, and at other times, such as in the mid 19th century, it became so bright it was incorporated into oral traditions by the Boorong Aboriginal people of northwestern Victoria, Australia. Astronomers think it's a good candidate to explode in a supernova in the future. The inauguration ceremony today for the VST was held at the Italian National Institute for Astrophysics Observatory of Capodimonte, in Naples, and attended by the Mayor of Naples and other dignitaries. The photo being released today was taken with the help of Chilean president Sebastián Piñera, who visited the Paranal Observatory on June 5. The new telescope is 2.6 meters (8.5 feet) wide, and boasts a giant 268-megapixel camera called OmegaCAM. The observatory is sponsored jointly by the European Southern Observatory and the Italian National Institute for Astrophysics.